The three small white buildings with blue shutters will be inaugurated on July 1, 2, and 3 with a series of concerts. The residence "will be able to receive a string quartet who might come to prepare for a concert, or a composer, or an ornithologist, because Messiaen was a bird lover, going so far as inventing a system to transcribe their songs, which still remains a secret," explains Bruno Messina, general director of the Isère artistic agency that will manage the establishment. Far from being anything like the sumptuous Renaissance palace of the Académie de France in Rome, the Messiaen house is "the anti-villa Médicis," says Messina. Significant work, costing 1.2 million euros and financed by the composer's estate, was carried out to solidify the foundations, to decorate the ceiling with images of bird, and to create three rehearsal studios. Very modern and well lit, the rooms have been cleared out of the kitschy bric-à-brac and religious objects beloved by the composer. This sanitizing of Messiaen's Catholicism is wrong-headed, as the faith is inextricable from Messiaen's music, but critics do it all the time, too. 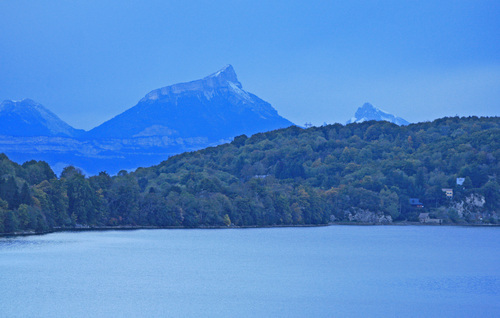 The plan is to leave the property, where Messiaen sat every morning to make his birdsong recordings, otherwise as natural as possible, with the proximity to the Lac de Laffrey, tall trees and other plants, and views of the Taillefer and Chartreuse massifs. The opening concerts will include 14 short performances of Messiaen's music, all free, recalling the Stations of the Cross, followed by a concert in the Basilica of Notre Dame de la Salette, with Roger Muraro on piano and Nathalie Forget on Ondes Martenot, coinciding with the 170th anniversary of the Marian apparition there.